After graduating first from Lafayette College and then from the Princeton Theological Seminary in 1898, Dr. Samuel M. Jordan spent 43 years as a missionary in Iran. He was the founder and president of the American College of Tehran, renamed Alborz College of Tehran. Dr. Jordan served as president of the institution from 1899- 1940 and during his period of leadership played a significant role in the growth of Alborz from an elementary school to a famous and respected college. He was well known for his dedication to expanding the size of the campus and enhancing the opportunities for the school and its students. An avid believer in the value of sports, he is credited with bringing football, volleyball, basketball and soccer to Iran. Dr. Jordan’s commitment to the academic community in Iran through his work at Alborz earned him the Iranian Decoration of the First Scientific Medal in 1940. After his retirement, Dr. Jordan made a trip to Iran on a good-will mission in 1944. A bust of him was dedicated at that time believed to be the only such bust of a Westerner in Iran. A principal street in Teheran bears his name as further recognition of his contribution to the country. 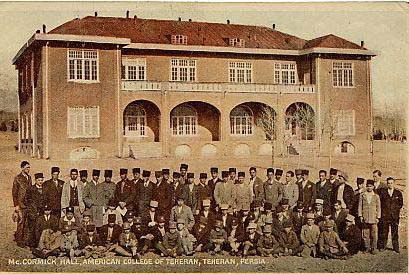 The American College of Tehran, 1930.